Four different cabinet secretaries will appear before defense-themed committees on Capitol Hill this week as lawmakers continue their work dissecting President Donald Trump’s fiscal 2020 budget proposal. 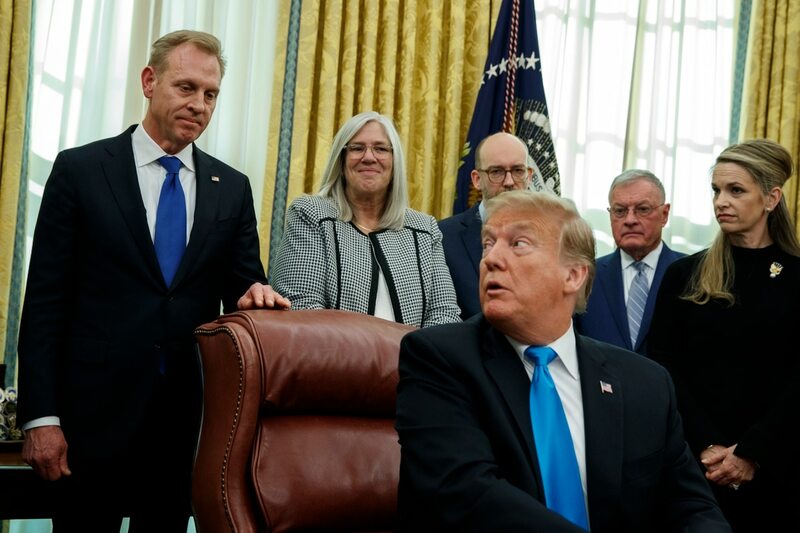 The biggest headlines for the defense community will likely come from acting Defense Secretary Patrick Shanahan, who is scheduled to testify at the House Armed Services Committee on Tuesday. Chairman Adam Smith, D-Wash., has already promised intense questioning not only on the budget plan but also the transfer of military construction funds to help pay for Trump’s controversial border wall project. As Shanahan’s testimony unfolds, VA Secretary Robert Wilkie will appear across the Hill at the Senate Veterans’ Affairs Committee to talk about his priorities for next fiscal year. On Wednesday, Secretary of State Mike Pompeo will lay out the justifications for his budget to a pair of committees. On Thursday, Energy Secretary Rick Perry will go before the Senate Armed Services Committee to discuss portions of his budget that intersect with military spending. Army Secretary Mark Esper and Army Chief of Staff Gen. Mark Milley will testify on the fiscal 2020 budget proposal. Outside experts will testify on the status of the United States diplomatic relationship with North Korea. Outside experts will testify on government corruption in Central and South America. VA Secretary Robert Wilkie will testify on the fiscal 2020 budget proposal. Acting Defense Secretary Patrick Shanahan and Joint Chiefs Chairman Gen. Joseph Dunford will testify on the fiscal 2020 budget proposal. Outside experts will testify on the impact on small arms transfers for U.S. foreign policy. Committee members will consider several pieces of pending legislation. The chiefs of the National Guard Bureau and service reserve forces will testify on the fiscal 2020 budget request. Coast Guard Commandant Adm. Karl Schultz will testify on the fiscal 2020 budget request. Service installation officials will testify on the fiscal 2020 budget request and the need for a new base closing round. Naval officials will testify on the fiscal 2020 budget request and challenges facing the service. Outside experts will testify on the state of U.S. relations with traditional European allies. Outside experts will testify on the state of U.S. relations with African partners and opportunities for growth. Outside experts will testify on tensions between Ukraine and Russia, and the impact on U.S. national security priorities. Outside experts will testify on how the prepared the U.S. defense industrial base is to deal with growing cyber threats. Adm. Phil Davidson, head of U.S. Indo-Pacific Command, and Gen. Robert Abrams, head of U.S Forces Korea, will testify on the fiscal 2020 budget request. Secretary of State Mike Pompeo will testify before the committee on the fiscal 2020 budget proposal. Representatives from the United Nations will testify on the effectiveness of sanctions on North Korea. Service officials will testify on the fiscal 2020 budget request and its effect on future years acquisition plans. Pentagon Comptroller David Norquist will testify on the fiscal 2020 defense budget proposal. Gen. John Raymond, head of Air Force Space Command, and other service officials will testify on the fiscal 2020 budget request and changes to their operations. Jim Bridenstine, administrator for NASA, will testify on the fiscal 2020 budget request. Officials from the National Guard and reserves will testify on duty status reform proposals. Secretary of Energy Rick Perry will testify on his department’s programs which fall under the fiscal 2020 defense budget proposal. Outside experts will testify on the health risks posed by PFAS chemicals, found near numerous military bases across the country. Michael Griffin, under secretary of defense for research, and service officials will testify on the fiscal 2020 budget request. Gen. John Hyten, head of U.S. Strategic Command, and other defense policy officials will testify on the fiscal 2020 budget request.